Prioritizing goals – How to prioritize. – To prioritize is to determine the order for dealing with (a series of items or tasks) according to their relative importance. • More focus on what matters and less rushing between random things tugging at your attention. • Peace of mind from the assurance that you are doing the things that really matter. • Make the most of your time and get maximum rewards for the least amount of time and effort. • Before doing things it is good to make wise choices about what to do for most benefit and happiness. • When prioritizing, typing a list is usually better than mentally trying to sort out a list in your head and trying to remember it. • If you have a list of things to be done, make it a habit to dedicate a little time for determining which things should be done first. • If you have a list, cross tasks off the list as you complete them. This gives you a rewarding sense of accomplishment inspiring you to go on. • How big is the anticipated return on my commitment of time and resources? If I successfully complete this action / project – what effect will it bring compared to other actions / projects. • How hard or easy will it be to figure out the steps needed to take this project to completion. • Is it better to start a big project or do something quick and easy? • If you deem that two tasks have the same importance and urgency, choose the task which requires the least amount of effort. • When deciding what to prioritize, you can also include factors like how much you will enjoy doing the tasks needed. • Prioritizing can be good for daily tasks, but take some time to prioritize your personal life-goals as well. For example things you want to do, places to go and skills to learn. • Be flexible and relax. Don’t go overboard with prioritizing everything, or it can end up being counterproductive stealing time and spontaneity from actually doing stuff. Use it with common sense as a tool when needed. • When you have a list of things (goals, for example) and want the important to arise to the top like bubbles. • Compare the two first items on your list. Decide which one is more important and label this your “favorite”. • Now continue and compare the third item on your list with your current favorite and decide which is more important. The one you decide is more important will become (or remain) your current favorite. • Now keep doing the same thing with every item on your list comparing each one with whatever your current favorite happens to be at this point. Whenever you prefer a new item over your current favorite then that item becomes your current favorite. • When you reach the end of the list, the current favorite that remains is the single most important item on the list. Thus, this becomes your “First favorite”. 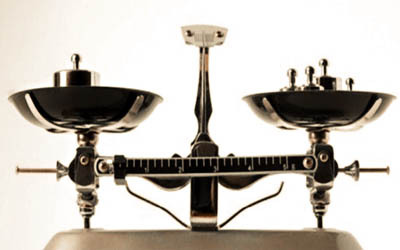 You have compared it directly or indirectly with every other item and preferred it every time. Mark it by writing a “1” beside it. • Now repeat the process (This time ignore the ‘First Favorite” because you have already ranked it) to find out your second most important item and mark it with writing a “2” next to it. Continue repeating this process comparing two items at a time, until you have sorted the whole list or as many as you see necessary (For example, sometimes you may just want to find out the top three). • This method is a handy tool which can be applied to other things too. For example, when you have several similar photo-shots and want to sort out the very best picture out of the similar ones, so that you can delete the others and be sure to save the very best shot. 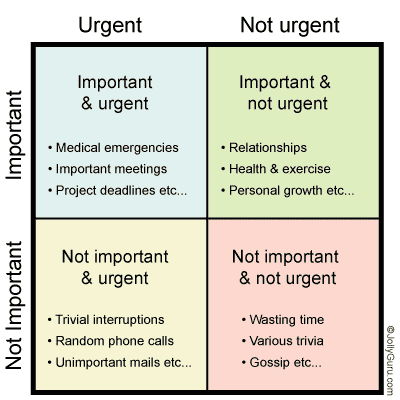 • You can see where your tasks fit into the following quadrant. – Attend a vital job-interview. – Meeting with a potential investor. – Book appointment with a dentist. – Answer a random phone-call. – Ironing and folding socks. • Remaining too much within the ‘Urgent and Important’-category is stressful and exhausting, which usually results in suboptimal performance. • Try to concentrate on tasks within the ‘Important but not urgent’ -category. If you don’t handle these, then some of them may eventually turn into ‘Urgent and Important’. On the other hand, if you plan properly you will tend to face fewer emergencies or pressing problems in your life. • Be wary not to let ‘Urgent but not important’ steal too much time from your ‘Important but not Urgent’ actions. However, it can be good to designate a day (i.e. once a month) to doing the little things cluttering up your to-do list. This can allow you to check off many items and free up your mind for the important stuff. • You can choose to spend less time within ‘Not important and not urgent’. Note that this does not mean eliminating things that relax you and make you feel happy, since those things are important. • What is really important is what will enrich your life the most and as such it is a matter of personal opinion. You define what is important to you based on your own values. Grid Analysis Prioritizing – A thorough and comprehensive way of prioritizing a list of items. • List all items in a row from top to bottom. • From left to right list the factors to consider when evaluating each item. • Now draw a grid (or use a spreadsheet program like Excel or the free ‘Open Office Calc’) and rate how well each item score in each factor. • Optional: If you happen to put more emphasis on some of the factors more than others, you can now multiply the scores for that factor by a value of your choice, let’s say x 2. • Now calculate the total score of each item to discover their relative position. Prioritizing Goals using "Grid Prioritization"
“What next action/project will have the greatest impact towards what I want relative to the least amount of time and effort?”. Did you find this information of value? Please pass it on using the share-tools below, or share your thoughts in the comments section.